Do you want your website to be only one of its kind and different from every other website? Do you want your organization to stand out from the clutter and have a unique appeal?  Do you want your online marketing campaign to be interactive with a touch of madness to capture not just the interest, but the hearts of your consumers?Then you have come to the right place! Avail our consultation services through which we talk you through our methods, talk about your ideas that you have for your business, get to know about your needs and requirements and let you know how we plan to conduct your project. Once we have established the main idea on which the whole video will revolve, we develop an intriguing story line and pass it on to the script writers. We incorporate your brand image in the story so the video is tailor made according to your business needs. 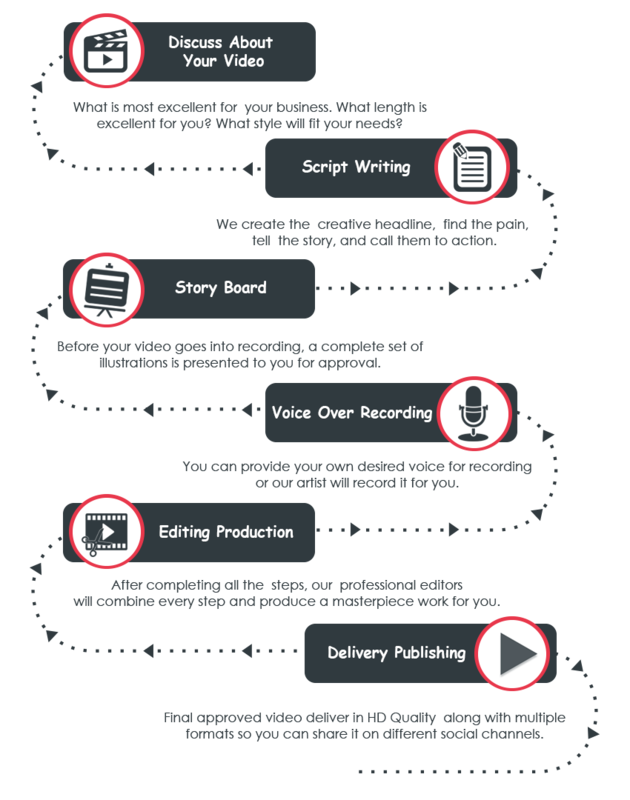 After the scriptwriters work their magic, your project is passed along to our video production team who creates an exceptional video using 3D and 2D animations, and brings life to your ideas. The video ensures that your brand image is plugged in according to your specifications and your consumers can relate to the message that is being delivered via the video. All stories need an artist who can narrate it with vigor! So, after the illustrations are completed, we pick the right voice over talent who possesses the right accent, clarity of speech and the right appeal to convey your message. If the client wants, we also add vibrant music to our videos so that the video has an extra punch that brings more vibrancy to it. We do not deliver this crude video to the client right away, rather our quality inspection team makes sure it is edited and polished before it is delivered to you. In this step, we also our clients to provide us with their valuable feedback, so that necessary additions can be made and the video turns out to be according to their exact specifications. We ensure that the final product is delivered to you right on the promised date so that you do not have to go through any hassle.